I just made a few big block windage trays for some friends and myself. I used a Guzzi oil sump spacer to mark the holes and outline. 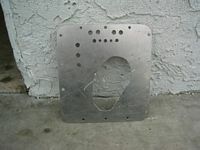 I drew the outline on some ~.100" aluminum sheet (no need to use steel) and then I cut it out on a band saw. I drilled three of the outer perimeter holes using the sump spacer as the guide. 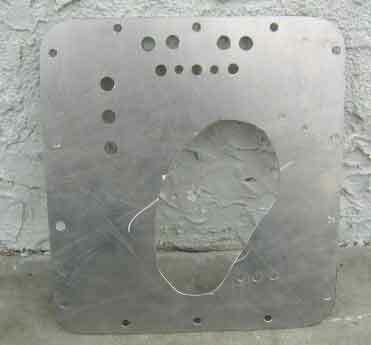 I then bolted the sump spacer to the aluminum with three bolts and used the spacer as a guide for where to put holes. Be careful not to damage the oil passages of the sump spacer if you do this!! This makes accurately transferring the holes from sump to tray fairly straightforward even if you don't have a good set of transfer punches. I used the drill press to punch holes at the specified locations to allow splash oil to drain down to the sump. The big cut out allows the tray to clear the oil filter, return, and dipstick.&nbsp; I cut this with a hand jigsaw, and cleaned up the edges with a Dremel tool with a sandpaper attachment. Make sure that you de-burr all of the holes that you cut. This will insure good sealing on all of the gasket surfaces. When I was done cutting, I cleaned my new tray with carburetor cleaner before I installed it. Note that there are two different sized oil passage holes in the oil pan and sump spacer.&nbsp; Also, pay attention to the oil passages when you are constructing your windage tray. There is no sense in adding any additional restrictions to your oiling passages that may negate any gains from the addition of the windage tray. Note that my design is almost the same as Pete Roper's. I have added additional holes at the front to allow oil from the timing chest area to drain into the sump. Note that there is a very small clearance between the surface of the windage tray and timing chest drain holes on the engine case. This seems to necessitate the drain holes that I added. You will need to use an additional sump gasket for this project, so keep that in mind when you're ordering supplies. Don't forget to coat your sump gaskets with anti-seize- it will make them much easier to remove the next time you take your sump off.